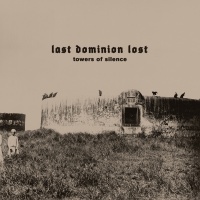 Towers of Silence marks the first album from Last Dominion Lost since their early nineties recordings surfaced on The Tyranny of Distance in 2004. Last Dominion Lost originally featured a trio of musicians from the early Australian industrial underground: John Murphy, Dominic Guerin and Jon Evans. Now without Guerin, the current formation of Last Dominion Lost remains heavy on the Australian contingent, with now resident in Berlin Antipodeans John Murphy, Jon Evans, and Julian Percy (Ratbag) alongside fellow Berlin resident Ash Wednesday (ex-Einstürzende Neubauten), and Till Brüggemann (Gerechtigkeits Liga) with lyrics from Annie Stubbs, performance artist and, who like Murphy and Guerin, spent time amongst the ranks of SPK. And that's a fitting comparison for Last Dominion Lost as Towers of Silence revels in post-industrial electronics and atmospheres. The title, Towers of Silence, refers to the funeral practices of Zoroastrian traditions where the dead are placed upon raised structures, in a manner similar to the sky burial of Tibetan cultures, exposing the bodies to the elements and scavenging birds. Towers of Silence opens with metal percussion and pounding drums of 'Stagma' riddled with angst-ridden cries, amidst revved-up keyboard stabs. The forceful aggression of the opener is replaced with brooding analogue rumbles set against the unsettling texture of industrial scrape, squeak and hiss of 'Sektor F'. While it does hover around the realms of atmospheric electronics 'Sektor F' does eventually progress into more chaotic territory with industrial percussion and shredded vocals which sit uncomfortably between the death-fixated posturing of power electronics and the sci-fi cyborg drone of the Daleks. Chlorpromazine', named after the anti-psychotic drug, offers something more pensive with its subdued electronics featuring the distant, scorched vocal of Till Brüggemann (Gerechtigkeits Liga) only adding to the bleak, despondency of this track. At this point it's worth pointing out that Towers of Silence fits nicely into the lineage of Australian industrial music and specifically SPK, who dealt with psycho-pathology in its myriad states. There's more atmospheric electronics to be found on 'Caesium Sunrise' with manipulated vocal tones over undulating drones, which gradually swell into something more sinister with the addition of darkened gloom chords. Things get even darker on 'Kavum' where over restrained electronics Josefina Rivera recounts her ordeal at the hands of serial killer Gary Heidnik who kidnapped and brutalised her - and many others - often confining his captives and victims to "the hole". I'm surprised that Last Dominion Lost have sunk to these serial killers things which in the whole post-industrial scheme of things has, if you can pardon my poor pun, been done to death. In fairness though, the confinement to the hole does have a loose association to places of the dead and the towers of silence referred to in the title. 'S.E.A.T.O.' almost acts as banishing ritual, as John Murphy in slow, drawled tones, unleashes a tirade of leaving demands - "leave us, you're not relevant anymore" - over pensive rolling drums and blasts of frequency jolts. Here Last Dominion Lost travel close to the sound of a subdued KnifeLadder, the industrial polyrhythmic trio featuring John Murphy, Hunter Barr and Andrew Trail. Even on the more ethnic sounding 'Hexatom' where John Murphy in spoken tones recites a wordplay on death - written by Annie Stubbs, his co-conspirator in life - over slow pensive drum rolls and fluttering shenai, the KnifeLadder comparison remains. With ghostlike voice accompaniment and moaning electronics 'Hexatom' becomes quite haunting. These comparisons with KnifeLadder are largely a result of Murphy's distinctive tones set amidst the rolling drums and reed-like sounds of the shenai that pierces these tracks. 'Chöd Ritual' manages to combine the ethnic with atmospheric electronics. With hand drums and ethnic pipes (a thighbone trumpet might have been more appropriate here), it goes all Tibetan ritual, with hand drums and treated vocals set against glistening synths. The entire feel is of a hallucinatory trip or a vivid dreamstate. The final tracks appear much more improvised in nature. 'Minol' is festooned with all manner of post-industrial detritus, while the closing title track marshals all the earlier elements - short bursts of drums, shenai wails, creeping brooding keyboards, and sampled tapes - into a slow paced crawl towards its demise.